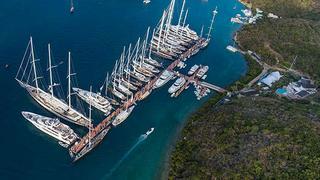 As an impressive superyacht fleet has begun arrive at the world class YCCS Virgin Gorda Marina in the British Virgin Islands, Boat International Media and Yacht Club Costa Smeralda are preparing to welcome owners, guests and race crew to the Loro Piana Caribbean Superyacht Regatta and Rendezvous 2015. The event, which hosts an exquisite collection of superyachts, takes place off the beautiful island of Virgin Gorda from 11 to 14 March. The stunning coastline, distinguished by huge granite boulders, inshore coral reefs and an abundance of what looks to be some breezy Caribbean trade winds will present outstanding sailing conditions making for an exciting regatta. A competitive mix of performance and cruising superyachts divided by class will compete over three days to take the esteemed champions title, whilst a flotilla of motor yachts participating in the Rendezvous will cruise in company to follow all the action on the racecourse. Returning sailing yachts will have the upper hand with their knowledge of the local waters. With Vitters’ yachts Inoui, Ganesha and Marie (see video here) competing against the likes of the new Royal Huisman Wisp and Southern Winds’ Blues and Cape Arrow (currently for sale) the regatta is set for an exhilarating time on the water. Boat International will be posting live race updates via twitter, so do follow us to keep up to date, #LoroPianaSYR. Owners and their guests are invited to relax and enjoy a welcome lunch at Oil Nut Bay’s superb beach club restaurant. In addition, the luxurious resort is extending their hospitality throughout the regatta, allowing guests of the event privileged use of their impressive facilities. A laidback yet glamorous Welcome Cocktail on the YCCS lawn kick-starts the event on the evening of the 11 March, and superyachts will take to the start line on 12 March for day one of racing at 11:00 local time (GMT-4). As well as first-class regatta racing, owners and charter guests along with their family, friends and crew can expect an arrangement of fabulous social events and the highest level of exclusive hospitality services. Title Sponsor Loro Piana will host yacht owners for an intimate dinner at the YCCS Clubhouse to round-up day one, whilst day two will be topped off by a cocktail reception for superyacht owners hosted by Pamela and David V Johnson. This exclusive gathering will precede the ‘Hollywood Glamour’ beach party hosted by Oil Nut Bay. Competitors and guests will attend a prize giving on the YCCS lawn to celebrate the winners of each race day, sponsored by Embraer Executive Jets and Oil Nut Bay and applaud the team crowned ‘Spirit of the Regatta’. The overall winner of The Boat International Media Trophy will be presented by Loro Piana Deputy Chairman, Mr Pier Luigi Loro Piana, joined by Commodore Riccardo Bonedeo and Boat International’s CEO, Tony Harris.The regatta concludes with celebratory and farewell cocktails to see the yachts off in style. *On behalf of the BVI Tourist Board, we invite you to enjoy our alluring 60 islands and cays; our tranquil blue waters and powder white beaches; and some of the most spectacular sailing in the world. Travellers come to our shores from near and far to capture the essence of navigating this beloved archipelago. Many nautical adventures can be found in the BVI and whether this is your first time visiting us, or you are returning to Nature’s Little Secrets, we welcome you to experience the charm and beauty of our destination. We are honoured to host the fifth annual Loro Piana Caribbean Superyacht Regatta & Rendezvous at the Yacht Club Costa Smeralda (YCCS) in Virgin Gorda. May you have a fantastic event! The British Virgin Islands Tourist Board (BVITB) is a statutory body responsible for the sustainable development and marketing of the territory’s tourism product. The primary objectives are to increase awareness of the BVI brand in the major source markets and to increase the number of visitor arrivals to the destination. A Director of Tourism leads the organisation with oversight by a Board of Directors. BVITB is headquartered in Road Town, Tortola with offices in the United States and the United Kingdom, with representation in Puerto Rico, Germany, Italy, Brazil and Argentina. Sub-offices are also located in Virgin Gorda, Anegada and Jost Van Dyke. For more information about the BVITB, call +1-284-494-3134. Undoubtedly, the Loro Piana Superyacht Regatta and Rendezvous will offer three exhilarating days of racing. To keep in touch with all the action on and off the water, follow us on Twitter #LoroPianaSYR, Facebook, Instagram and catch up with Boat International Contributing Editor Tim Thomas’ highlights and race winners each day right here on BoatInternational.com.